"Recently I bought a book by British artist, Keith Shackleton, published in 1954 and titled ' Wake.' It is full of lovely drawings and reproductions of paintings, mostly of small boats of the era, coupled with brief, informative essays. Gunning punts feature in Chapter 12; the 2 black and white drawings and one painting showing a craft of more elegant form than the one in your photos, which appears to have been compromised for outboard power. Oral legend in my family says that when they emigrated from Orkney in 1857 they brought with them a small cannon which was bolted to the front of a boat and rowed or possibly punted out on to Lake Waihola, south of Dunedin, New Zealand. The lake is shallow and largely surrounded by swamp, even more so in those days presumably. The cannon was loaded with shrapnel and the record for one shot was said to be 102 birds. Sounds hideous in these conservation-minded times, but I am sure that the catch would have been distributed around the district and the surplus smoked or salted. The cannon, sadly, is nowhere to be found today. I recall seeing somewhere a photo of something called a punt gun, which was a multiple-barrelled device, the barrels splayed outward from a central point and presumably ignited readily at that point. The field of fire must have rendered this a devastating weapon. I can't recall the origin. Shackleton's drawing shows a gun with a single, very long barrel. Feel free to excerpt any of this for your comments section. Coincidentally, Wildside Books and Art in Great Malvern have a wonderful picture by Keith Shackleton of a wildfowler and his punt, complete with gun. 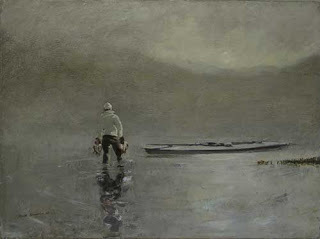 It is grey winter's afternoon and the fowler is carrying his catch back to his boat, knee deep in his waders with a handful of game in either fist. The artist's note reads 'It was an afternoon with gently drifting sea mist and a moon-rise before sundown." The picture is priced at £2,200 - I must start saving. The book, Wake, is available on alibris at prices from £20 up.